The loafer is, by far, my favourite trend of Fall, because i really feel like it's something i can invest in, and still wear a year from now. 1. 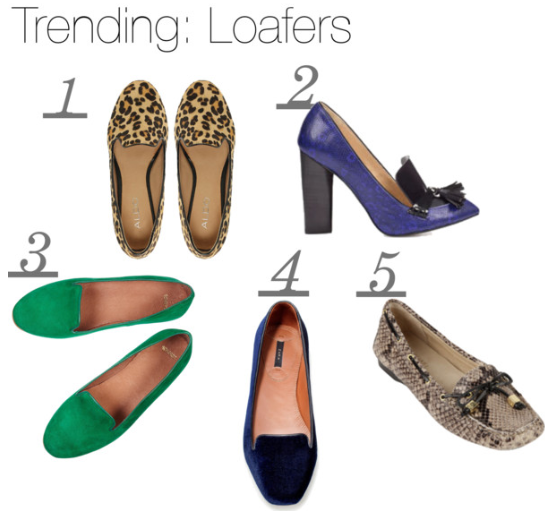 ALDO Leopard Print Loafer, 90. 2. ZARA Heeled Loafer, 109. 3. Topshop Green Suede Loafer, 105. 4. ZARA Velvet Loafer, 72. 5. Michael Kors Snake Skin Loafer, 145.